Add some Caledonian charm to your big day. 1. Hold your very own Highland Games. Victoria and Richard got married at Bunchrew House in 2012. They decided to hold their very own version of the Highland Games to entertain their guests after the ceremony, complete with a tug-of-war, welly throwing, and even a caber toss. 2. Brighten up your venue with these hanging hearts. Just £1.50 each from this Etsy shop. 3. Make your own mini tartan sweet jars. £1.50 will get you four IKEA spice jars just like this. Jazz them up with some tartan ribbon, drop in some Edinburgh Rock or home made tablet and you're good to go. Alternatively, you can buy the ready-filled jars above from this Etsy shop. 4. Or dainty soap favours with Scottish botanicals. Making your own soap doesn't have to be difficult: You can melt some plain bars and add Scottish ingredients like heather, oats, lavender, gorse, berries, even whisky. Just follow this easy "melt and pour" soap making tutorial. 5. Design your own tartan shoes. London-based shoe firm Upperstreet will turn any tartan into one of eight beautiful bridal shoe designs. It's a great way to celebrate your family tartan (or your future family tartan) on your big day, and it can all be arranged online. 6. Or simply add a bow instead. Bouquet by Rosa Loren sell a wide range of tartan shoe bows for £12.64 per pair. 7. Use the same tartan to create beautiful buttonholes. Create easy buttonholes by tying together white heather and thistles with a tartan ribbon, or choose one of these pretty (and spike-free) artificial silk versions instead. 8. Use vintage teapots or jars filled with dried Scottish wildflowers as table decorations. Dried flowers last indefinitely, so you can also offer them to guests to take home as gifts at the end of the day. Make sure you don't pick any protected Scottish species, and follow the Wild Flower Society code of conduct when collecting. 9. You can also turn them into a floral crown. There's a great tutorial here. 10. 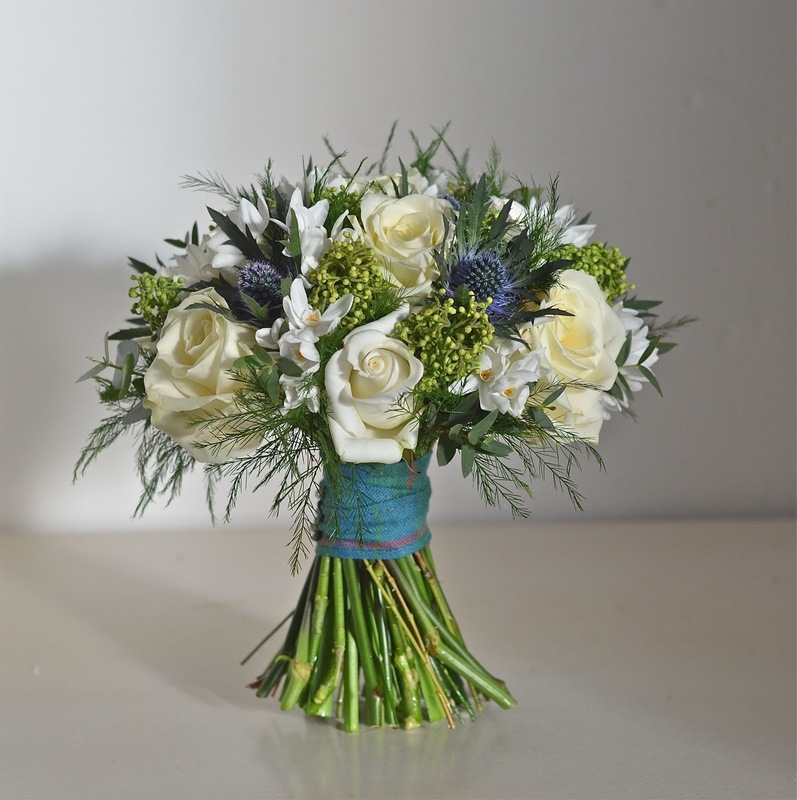 Add a touch of tartan to your bouquet. Wrap strips of your family tartan (or just a favourite tartan) around the stems of your bridal bouquet to personalise it. Alternatively, you can buy this cute tartan paper flower bouquet from Etsy. 11. Make sure you include a sprig of white heather. In the Borders, a sprig of white heather is added a bride’s bouquet for good luck. Or just nod to the tradition with these white heather earrings from Etsy instead. 12. Give your loved one a Luckenbooth. This traditional Scottish brooch (called a Luckenbooth) is often given as a betrothal gift. If you don't like brooches, choose a Luckenbooth bangle or cufflinks. 13. Or add a Luckenbooth to your wedding invitations. So pretty. You can buy a Luckenbooth stamp set here. 14. Wear a tartan dress, or buy a detachable train. This stunning tartan dress is the work of Glasgow-based designer Joyce Young. You can also buy detachable tartan wedding trains from this Etsy shop. 15. Seal your union by drinking from a quaich. A quaich is a traditional two-handled drinking cup, usually made from wood held together with bands of silver. Simultaneously drinking from the quaich during your ceremony is a great way to symbolise your commitment to one another. 16. Name your tables after Scottish mountains. Or lochs, if you're not that keen on heights. Angelfins Stationery in Renfrewshire create these beautiful handwritten table plans for £35. 17. Top your cake with tartan bunting. £11.50 from this Etsy shop, or make your own. 18. Choose a thistle design for your wedding rings. Who needs roses and hearts when you've got thistles and Luckenbooths? 19. Serve cranachan instead of canapés. It's a good idea to give the guests something to nibble on at various points throughout the day; at least one of those treats should be a serving of boozy, creamy cranachan filled with Scottish raspberries. 20. Sew some tartan to your garter. If you're good with a needle and thread, you can add a tartan ribbon to an existing garter to create something new (and awesome), or pick up one of the lovely handmade ones above from Frances Helen Bridal. You can buy dried heather confetti here if you don't have time to pick your own. 22. Include fresh, seasonal Scottish berries in your cake or wedding breakfast. Scotland is the main producer of berries in the UK as strawberries, raspberries, blueberries, and blackcurrants all thrive in the cooler Scottish summers. It would be a shame not to make use of them on your big day. You can even pick your own. 23. Or serve your guests Cairn O'Mohr fruit wine. Perthshire-based wine company Cairn O'Mohr make the most of the annual Scottish berry bounty by turning it into a range of delicious fruit wines. Their dry, sparkling Scottish oak and elder wine is a great alternative to champagne. 24. Give your groomsmen Harris Tweed hip flasks. They're available in a range of colours and tartans from this Strathaven-based Etsy seller. They make perfect groomsmen and best man gifts. 25. Thank your bridesmaids with a thistle pendant. Each one is handmade using a real Scottish thistle suspended in resin on a a silver chain or tartan ribbon and costs £25. You can order them here. 26. Most importantly, don't forget to dance. It isn't a Scottish wedding without a cèilidh, but you could always break with tradition by booking cèilidh/urban dance fusion band Bahookie. They've been described as "fiddlers meet The Foo Fighters", and they rock. H/T to Northern Ireland-based wedding photographers This Modern Love.